Despite it being just a few weeks into summer and the fact I am really trying to honour the necessity of some much needed time to recharge, there is still a whole lot of “education” going on around my house. Roo, my ten-month-old Australian Cattle Dog/Beagle mix puppy is learning every single day, and very much still in need of some teaching or training. Roo is the quintessential puppy; high energy, playful, fun and inquisitive. She loves bones, balls, sticks, water, treats, things that move and walks. She has many great qualities. She is good on the leash, very sociable with dogs of all sizes and ages, affectionate, easy going and always happy. She is resilient and tough; already battling through two UTIs and an allergic reaction in her short life. She can also be difficult to manage when she gets amped up, likes to bark at our three cats and struggles to behave appropriately at times around food. She is still learning. Hence, I turn on “teacher mode”. Don’t get me wrong. I am not suggesting that educating the youth of today in schools can be equated to the learning and training of a puppy, but yet there are many parallels. Over the last number of weeks, I have been struck by just how many. In many ways, learning is learning, regardless of the audience. Setting the stage to know what to expect and being consistent is key. Learning is a marathon, not a sprint. It often takes time. Chunk expectations and goals. Be patient. Celebrating successes, honouring strengths, reinforcing the positive and planning for next steps is what keeps learning moving forward. Roo trusts me. We have a connection and a bond. This whole dynamic is much more complicated with the whole master and dominance piece with dogs, but ultimately it all comes down to relationships. What works for one learner will not work for all. Every learner is different. Be a problem solver, differentiate and look for alternative means to reach the goal. All of these principles drive the work I am doing with my puppy this summer. They also are reflective and embedded in the work I have done with both children and adults over the last twenty plus years. Learning is learning. Roo’s learning is a work in progress. That’s true for all of us. And as we continue to work on her training this summer, I learn alongside her. She also teaches me many things. She reminds me to greet each new day with enthusiasm, play more, enjoy the simple things, and love unconditionally. There is much we can learn from each other! Wish me luck as the adventures of Roo continue! Much of the work I have done with learners over the last few years has been built upon the process of Design Thinking. Whether it be planning and programming at the STEAM Enrichment Centres, working with teachers around innovative practices that support student-driven, creation focused learning, or guiding students through the creative process while working on Destination Imagination Team Challenges; all these elements involved some form of design thinking. Design thinking is a mindset. The ultimate goal of design thinking is creative solutions to solving problems. Many educators in my school division use this model of Design Thinking to drive the work done with students in this area. Building common, consistent understanding and shared vocabulary across, grades, classrooms, within schools and even beyond is very beneficial. As a former Inquiry Support in a K-8 school for 10 years, I have many strong beliefs about the power of Inquiry-Based approaches to learning. I have given a lot of thought and had many rich conversations with colleagues around how Design Thinking fits into an Inquiry-Based model. In my mind, Design Thinking is just one of the many entry points to using an inquiry approach in the classroom. The image below I co-created a couple of years back helps to illustrate this concept. There are many entry points on “THE INQUIRY LANDSCAPE”. Sometimes our students we may need more of a “wander and wonder” model that starts with a topic or question and is more “research” focused. Sometimes we use the scientific method if applicable. And sometimes when we are starting with “creation in mind” whether it be a product, idea, campaign, sculpture, structure etc. we may move towards the Design Thinking Process to guide our inquiry. What may in some respects make the DTP unique from some of the others is the very natural way questioning comes out through the creative work often in “need to know” kind of ways as opposed to starting with questions in mind. In the end, I view, inquiry like the “umbrella” term or concept with multiple entry points or models as the “spokes of possibility” below. Having multiple strategies to support student learning is nothing new. When we guide students in learning to read we offer them a variety of strategies to use when they come to word they don’t know ( ie. Chunky Monkey- chunking the word, Eagle Eye -looking at pictures for clues) When kids are faced with a word problem in math, we support them in developing a variety of problem solving strategies (work backwards, develop a model etc. )to tackle the problem. We constantly strive to build multiple tools for students to have in their toolbox in a variety of contexts. I see inquiry models and processes through that same lens. Different ones are going to be needed to be used at different times. Design thinking as a process may be used by students to drive a task assigned by a teacher or to tackle a challenge the student has identified as a need in their surroundings (school, community, world). Regardless of what Design Thinking Process model we are choosing, or whether students are using design thinking to build a structure, construct a piece of art, design a PSA (public service announcement) to address a community need, create code to program a device, or develop a solution to a math problem,the steps of the process remain similar, as does the powerful opportunity for learning. The ultimate goal of using a Design Thinking Process with students is the development of students as creative problem solvers. If we can support students starting in the early grades by giving them simple design tasks or challenges as opportunities to learn to understand the process of design thinking we set the stage for them as learners moving forward. If we offer students the chance to be innovative thinkers with ample opportunity to empathize, anticipate need, ideate, design, build, develop, invent, mashup, collaborate, and create we further empower them as learners. When we support students in developing a design thinking skill set throughout their years in school we fill their toolkit as the creative problem solvers we need for the future! This past week this beautiful plaque honouring the life of our friend and colleague, Kevin Mowat was dedicated and displayed in the hallway where he once worked. On it reads a poem that meant a lot to Kev. It was a poem he shared often with others. In fact, in sorting through some of his things in recent times, it was a poem that served as the front page of a number of his binders full of professional resources or meeting minutes, a daily inspiration. It makes sense that this poem resonated so much with Kevin as he certainly loved much and often and won the utmost respect of the many many children and colleagues who crossed his path. There was no one more skilled at finding the best in others, and celebrating the beauty and joy in everything life had to offer. He has most certainly left the world a better place because he lived. By any measure, Kevin Mowat succeeded. Lately, I have been thinking a lot about change. Change is a given. Change is unavoidable. Change is what drives progress, growth and moving forward. However, for some people and depending on the circumstances change can be very challenging, particularly when it is change that is unexpected, unwanted or beyond our control. Change means letting go of something known and often a shift to something new and foreign. It means doing things differently and moving away from the status quo. It means stepping out of our comfort zone, while embarking on a journey into unchartered waters, and with that comes uncertainty. Ultimately it is not change that makes most people uncomfortable but instead the risk and unpredictability of the unknown. So how do we best support others in a time of change? How do we ease feelings of fear and anxiety? Focus our positive energy on moving forward. Socrates said, “The secret of change is to focus all of your energy not on fighting the old but on building the new”. Negative energy is wasted energy. We reap what we sow. The fruit is in the seed. When we put positive energy out into the world, it comes back. Be compassionate with one another. Plato reminds us, “Be kind. For everyone is fighting a battle that you know nothing about”. Each of us processes and deals with change and uncertainty in our own way. In times of change first and foremost we need to be empathetic and patient with one another. Keeping lines of communication open is key and we must be mindful of supporting those around us in whatever way they may need. Embrace new learning. Seth Godin suggests, “Discomfort brings engagement and change. Discomfort means you’re doing something that others were unlikely to do because they’re hiding out in the comfortable zone.” We do our best learning when we are pushed out of our comfort zone, move in new directions and are forced to imagine the possibilities. Expect resistance and plan for it. Frederick Douglas once said, “If there is no struggle there is no progress”. One might argue that we can strive to remain positive, aim to model empathy and welcome new learning as individuals; but ultimately how do we support those who are struggling with or who refuse to embrace change moving forward? Realistically, every situation and context is different and we need to honour this and recognize that everyone’s “Point A” or starting place and change of pace, is unique to them. Supporting and scaffolding levels of change is a necessity. In driving change we must also ensure it is informed change, guided by professional inquiry and grounded in research. In addition, we must be clear in and remain true to, our original intents and focus for change. When we are transparent and clear about why we are doing what we are doing, we build trust and connections flourish. In the realm of education, the end game should always be; doing what is best for learners. With any change we implement, our utmost target must be our students’ success. There will always be individuals who may be apprehensive of change or even stand in the way of it. These people may be in need of more than a just a gentle nudge at times. For those who remain resistant or even try to sabotage forward progress, we need to continue to be clear and explicit in our vision and plan for student success. In the end, the train is moving and for those who don’t eventually get on board, get left at the station. Change and uncertainty are inevitable and typically a non-negotiable in the name of progress. How we choose to deal with each and the path we take along the way is up to us. This past week I had the opportunity to present, share and learn while attending the Riding the Wave Conference in Gimli, Manitoba. Some great learning, coupled with a number of wonderful colleagues, set with the beautiful Gimli backdrop made for an awesome few days. It was time well spent. During one of the sessions I attended facilitated by Brandon educator, Allison Greig, she shared this video entitled, “The Time you Have (in Jellybeans)”. That doesn’t leave a whole lot of time….just under 3000 days. What are we choosing to do with that open, flexible time? How can we make the most of it? Life is short. We never know what’s around the next corner. Time is precious. There are many applicable idioms that encourage us to make the most of the time we do have. Finding what makes us happy, what we love to do, and what we are passionate about can help us fill some of these 3 000 days in a rewarding, meaningful, fulfilling way. If you follow this blog, you know the word in its title “Meraki” means, “the soul, creativity or love you put into something.”. 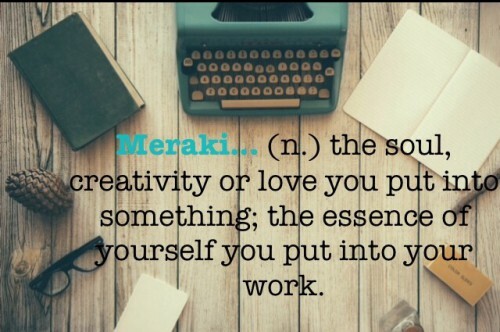 Finding our “Meraki” can help us make those near 3 000 days really count. If we did a comparable jelly bean video analogy analyzing the time we spend over the course of these 14 256 hours in schools, what would the break down look like? How many jelly beans would we move out representing compliance driven assignments, busy work or tasks focused on rote memorization of facts? How many jelly beans would be tagged to highly meaningful, and relevant learning? How many jelly beans would involve opportunities that both engage and empower learners? We need to be intentional in all that we do and ensure that the 14 000 hours our students spend in schools is time well spent. The bus crash that took the lives of 16 Canadians on April 6, leaves a nation in mourning. In the aftermath of such a tragedy, my heart goes out to the families and friends of the victims as they navigate the unimaginable. My heart goes out to the billet families and the citizens of Humboldt as they deal with the aftermath of such tragic events. And my heart goes out to the Broncos hockey organization and the greater hockey community as they process this tremendous loss. When we lose so many in such a sudden and catastrophic way it has a ripple effect, causing repercussions and impact far beyond what one might initially expect. This tragedy was one that broke the heart of a nation and was felt by millions of parents, hockey lovers, and Canadian citizens from coast to coast and beyond. In the wake of such tragedy, it is hard to predict what may hit home with each of us or resonate most, in relation to such a tragic story. As a teacher, I can’t help but think about how many times I have traveled on a bus with students over the past twenty years and imagine the “what ifs”. And as a teacher, I can’t help but think about losing some of my own students and how heartbreaking that would be. As teachers, our students are part of our lives day in and day out. We often spend hours a day with them and depending on context sometimes we even know them for years. In turn, we share our lives with them and we let them into our hearts. We become a community; a family of sorts. We get to know them and we come to care about them in a special way that stays with us. Teaching is a profession of the heart. So today my heart also goes out to the many teachers that have been impacted by this tragedy; the teachers and support staff who have worked with the 16 people we lost over the years and the teachers in Horizon School Division in Saskatchewan. My thoughts are also with the many, many students that have sat beside those lost in classrooms over the years and been a part of their “educational families”. As those affected most by the events of April 6, 2018 continue to pick up the pieces and mourn this tremendous loss, please know that you have the support of a nation behind you. We are all #humboldtstrong. As always, participating in IMMOOC Season 4 has been a very valuable experience. This week’s prompt of; How are you working to make the world a better place by creating more thoughtful, compassionate, creative, and skilled individuals? really spoke to me. This question in many ways captures what I see as our end goal and ultimate mandate as educators; helping to support our students in becoming the most compassionate, creative and skilled individuals they can be to prepare them for their future. I am blessed to serve as the Manitoba Affiliate Director for the non-profit organization Destination Imagination. My life and own learning has been deeply enriched since becoming a part of this phenomenon a number of years ago. One of the ways I make the world a better place is by spreading the true joy, creativity and deep learning that is at the core of Destination Imagination. One way I support the development of compassionate, creative and skilled individuals is through this initiative each year. Last week I watched as 17 teams of over 100 students from throughout Manitoba came together to share and celebrate their learning at the Manitoba Destination Imagination Provincial Tournament. It was event charged with high energy, great enthusiasm, and creative spirit. DI is the largest creativity program in the world. It is present in over 30 countries, 48 states and at varying levels in provinces across Canada. DI has been around since 1982 with over 2 million participants since and 150 000 annually. It is a leader in inquiry and project-based learning and blends STEM with fine arts and social entrepreneurship. At the end of each summer, DI publishes 6 different challenges and teams of up to 7 students spend the next 9 months trying to come up with the best solution possible. Then students compare their solution to those of others at a tournament with the culmination being the Global Finals in the third week of May where they can compare their solution with those from around the world. DI gives learners of all ages (primary to university) opportunities to use the creative process to design and manage a project, and gain the skills needed to succeed in our 21st C world. They learn to communicate, collaborate and think both critically and creatively. They learn to problem solve and be novel or flexible in their thinking. As they meet trials and experience failures along the way, they practice perseverance and develop resiliency. They explore, experiment and learn to think outside the box as they imagine, plan, design, create, refine and share their solutions to challenges. They learn empathy, compassion, patience and the art of compromise as they work collaboratively with others. Each team’s solution is unique and presented in an eight-minute performance which showcases the individual skills, strengths, interests and passions of the team members. Sometimes just the right thing somehow crosses our path at just the right time. Destination Imagination is just that thing for many as it continues to help develop more thoughtful, compassionate, creative, and skilled individuals each year, across the world. The 4 Es of Innovative Teaching and Learning? I always appreciate the IMMOOC blog challenge of 300 words or less. For someone a bit wordy like me, it forces me in to streamline and be succinct; useful skills to practice. Effectiveness -how does the innovation improve understanding, deepen thinking, enhance learning and build skills in a way that is better or improved for learners? Efficiency- how does the innovation potentially save time, resources, or energy. How does it make connections that weren’t there before? Engagement- how does the innovation create a learning environment that is enjoyable and supports a student’s willingness, need, desire, and interest to participate in, and be successful in the learning process? Empowerment- how does the innovation create a learning environment that supports students owning their learning, the ability and/or agency to make decisions and implement changes related to their own learning, and/or impacting their own schools, and beyond? As educators continue to explore innovative teaching and learning in classrooms, schools, and districts, the lens we look through will inevitably shift and change. The 4 Es above are just a few perspectives to consider. Are there others? Thoughts?